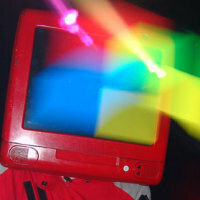 The robotcowboy mask is a lightweight version of the robotcowboy helmet. It is a tool for mobile visual presentation and cyborg transformation. The smaller, lightweight design allows for more visibility during performance. A wrap around led matrix provides almost 180� visual Tellurian communication. It is constructed from a welders mask, a custom led matrix using Max 7219 chips, and an Arduino mini. 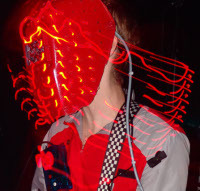 The robotcowboy helmet is a tool for mobile visual presentation and cyborg transformation. The design was originally developed by Space Ranger Research to aid in communication with the Tellurians, an alien species whose mutable faces act as a form of visual words. This facial pattern changes for them as much as our mouth and lips do when speaking. Naturally, this technology has numerous commercial applications and Robotcowboy Industries has constructed this prototype for experimental research. The device consists of an iMac skin, lcd monitor, motorcycle helmet, video camera, and video goggles. I have used it for experimental performances, live vjing, and live vjing while dancing. The graphics generated through a custom sprite-based visual program controlled over OSC.